Hey Friends! You haven’t heard from me in a while…I’ve been getting my first born launched off to college life and burying myself in a bunch of comfort food. ? I’ve needed a few weeks to get through the curve of this new home dynamic…and happily, as I’ve eaten my way through all sorts of decadence and found this new take on Lasagna. 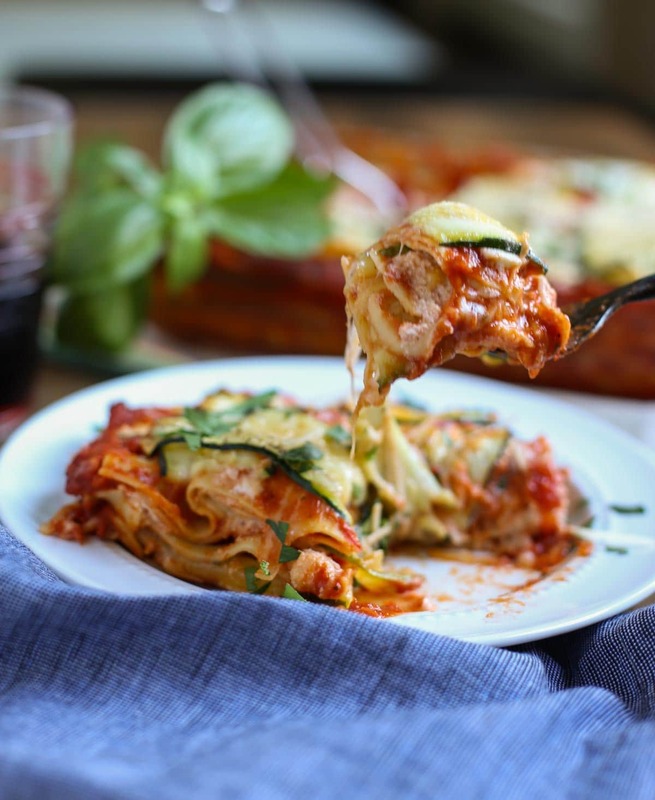 Lasagna can be your best friend any time of the day…from dinner to breakfast! 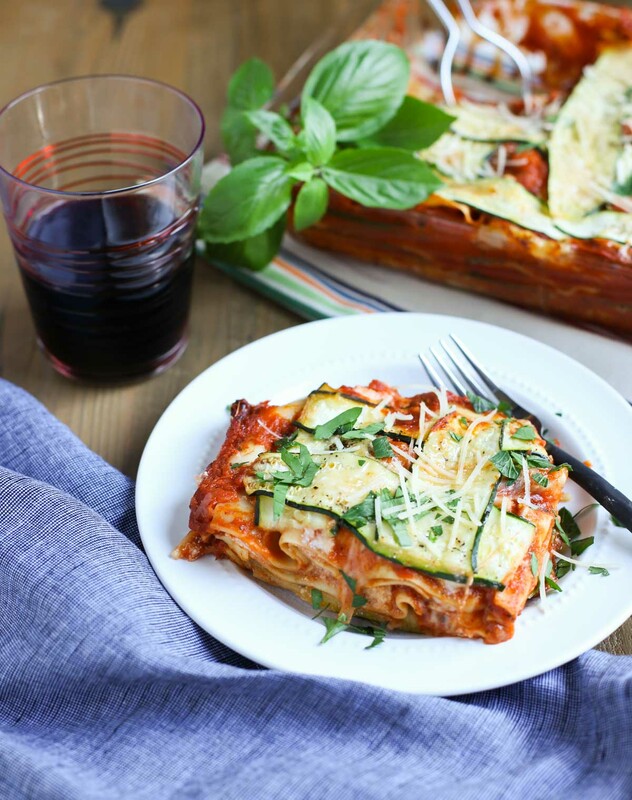 And what is not to love about this Zucchini Lasagna! Look at this Lattice Designed Zucchini! Got my attention quick. I was thumbing through a Southern Living, which you can always count on for some great recipes, and saw this picture. Yes, it’s the picture that got my attention…not the recipe first. Look at that lattice pattern…ANYTHING with lattice just seems more elegant, sophisticated, and somehow better…you agree? It’s so pretty and appealing! 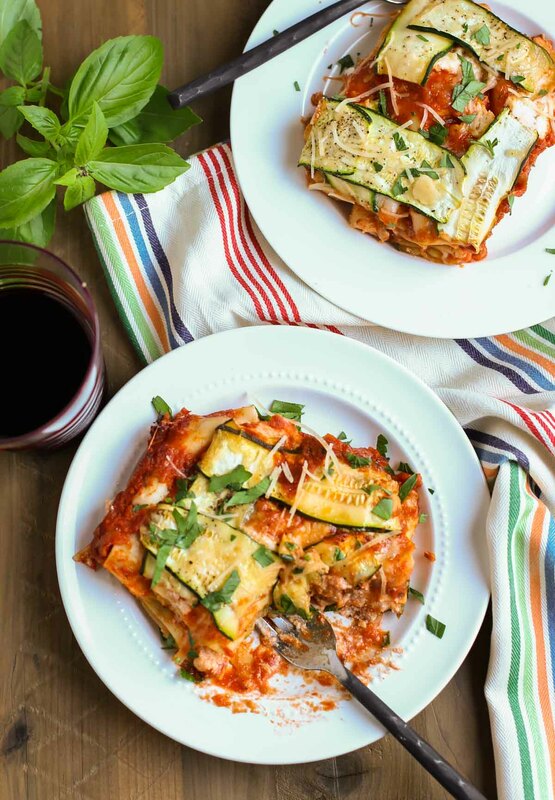 I’m calling it Pretty Zucchini Lasagna… it just looked like something I needed to try. And share! So, here are some short cuts. First off, you buy the “oven-ready” lasagna noodles. Might be one of the most useful pasta ideas of the century. (why didn’t we come up with that?!) Secondly, you can use any jarred marinara sauce! I had to use our own sauce. “Pastably the BEST sauce Ever!” red sauce…in microwavable pouches…family friendly, and honestly delicious – the BEST! 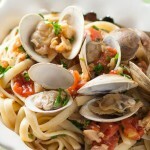 This recipe doesn’t feature our pasta…but it’s finally our sauce that is the star! If you don’t have any of our sauce on hand, please go to the store and buy a GOOD sauce…not one loaded with extra sugars, etc. There are many good sauces out there, so use your best judgement….just not the super cheap stuff. Now slicing the zucchini into ribbons can be a challenge if you don’t have a mandolin. I have two different ones, a cheap one and an expensive French one. Honestly, if you aren’t getting to fancy with all your vegetables, there are plenty of good options on the low end ($15-20 range). You can pick one up at Bed, Beth, & Beyond or Amazon. Getting the zucchini sliced really thin is the key to actually weaving this dish together and also the thinner slices taste more like noodles! It is a good way to sneak some veggies into a dish. My younger son (down to only one child now..waahhhh!) 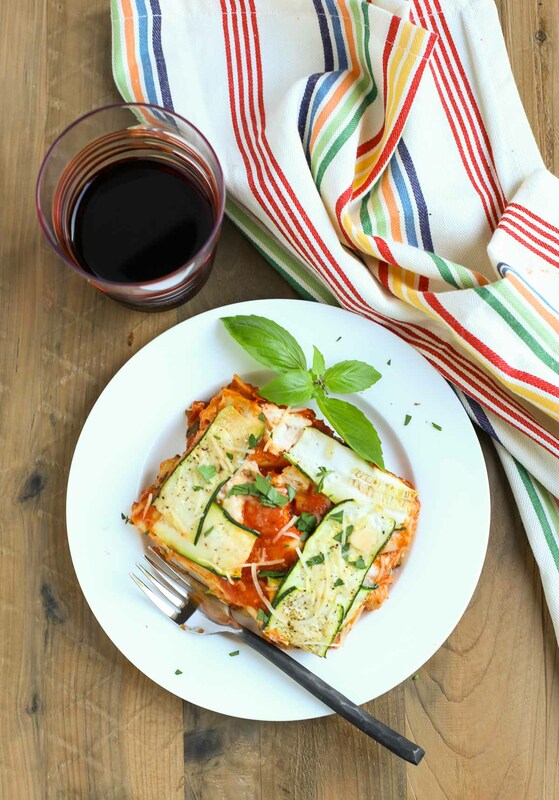 usually doesn’t like zucchini, but in this lasagna – he loved it. 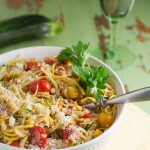 When you bite into the layers of cheese, noodles, and zucchini, you only notice the wonderful textures and creamy delicious flavor…yum! For this time of year when comfort foods start making their way back into our lives, two other timely dishes come to mind, my Tailgate Timballo and Butternut Squash and Kale Cannelloni…both recipes combine presentation with great fall taste. And lots of comfort too! But it’s probably time for this Momma to stop comforting herself and get back to some more exercise – in and out of the kitchen! 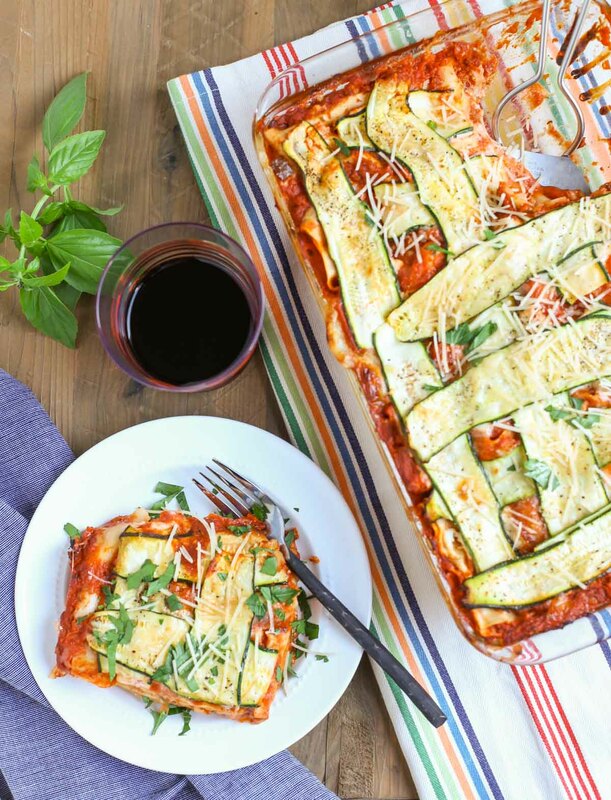 Enjoy this Pretty Zucchini Lasagna and let me know what you think! Just the Prettiest Lasagna in town! Delicious and easy to prepare…great for many gatherings! Freezes well too! Preheat oven to 375 degrees. Line a large baking sheet with paper towels. Using a mandoline, slice zucchini length wise into very thin slices. Place in single layers on paper towels, sprinkle evenly with salt. Let stand 10 minutes and gently press strips with paper towels to remove excess moisture. Rub inside of a 9 x 13 inch glass baking dish with olive oil and then rub entire inside with cut sides of garlic. Place 3 lasagna noodles in bottom of dish. (They will not cover entire surface but will expand when cooked). Top with 1 cup marinara sauce, spreading evenly to cover noodles. Top evenly with 1/4 cup ricotta, 1/4 cup Parmesan, and 2 ounces of mozzarella. Cover with about 1/4 of the zucchini strips, sprinkle with basil, and 1/4 t. pepper. Repeat layers twice. Layer withe remaining noodles, 1 cup marinara and 1/4 cup ricotta. Top with 1/4 cup Parmesan and remaining 2 oz. mozzarella. 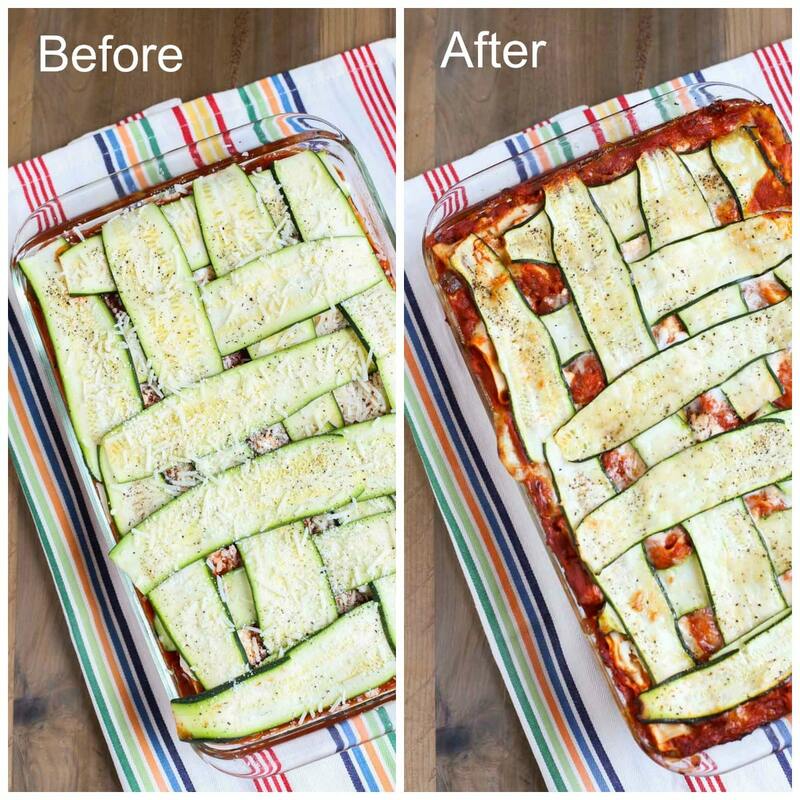 Arrange remaining zucchini strips on top in a lattice design. Sprinkle remaining 1/4 cup Parmesan and 1/4 t. black pepper. Cover with foil, bake for 45 minutes. Remove foil and bake until top is lightly browned and noodles are tender, about 20 minutes more. Let stand at least 15 minutes before slicing. Enjoy!! I’ve never seen lasagna like this before! Gorgeous! This lasagna is amazing! The zucchini is a healthy and delicious addition! 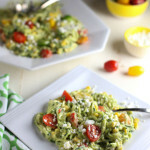 A healthy twist on my favorite dish! Still tastes DELICIOUS! LOVE!